Amanda Macinga, left, and Nicole Pavlansky. 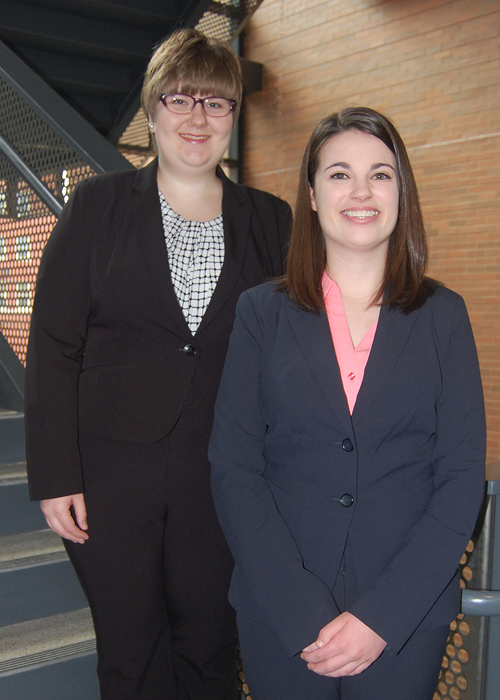 Amanda Macinga of Struthers and Nicole Pavlansky of Boardman, accounting majors in the Williamson College of Business Administration at Youngstown State University, have been selected to receive the Institute of Management Accountants Ohio Regional Council Scholarship. The IMA scholarships are given at both the undergraduate and graduate student levels and are based on academic merit, extent of IMA participation, and strength of outside recommendations. The scholarships are awarded to any student with an accounting major who is enrolled at an Ohio college/university. Macinga received a $2,500 scholarship. She completed her sophomore year at YSU and is involved in the WCBA Business Leader Program and Enactus group. She is doing work with the campus Emerging Leader Program and will be chapter secretary for IMA this coming Fall. Macinga also plans to obtain a master’s degree and become a Certified Management Accountant . Pavlansky received a $1,500 scholarship. She just completed her junior year at YSU. Pavlansky plans to earn her Certified Management Accountant certification and become a Certified Public Accountant. She is a member of the IMA and Beta Alpha Psi. Her volunteer work includes raising funds to supply clean water in Uganda. The IMA is a worldwide association of accountants and financial professionals who have careers in business. The association has a membership of more than 80,000 professionals and students.